As I posted last month, the funding game for the Westside Subway Extension and the Downtown Regional Connector projects was shifting from Los Angeles County to Washington D.C.
Now it’s official. Earlier this month, Metro CEO Art Leahy submitted a formal request for $77.6 million to the federal government, with the money to be used for preliminary engineering for the two projects. In addition, two members of Congress — Rep. Diane Watson and Rep. Henry Waxman — wrote letters supporting Metro’s request. 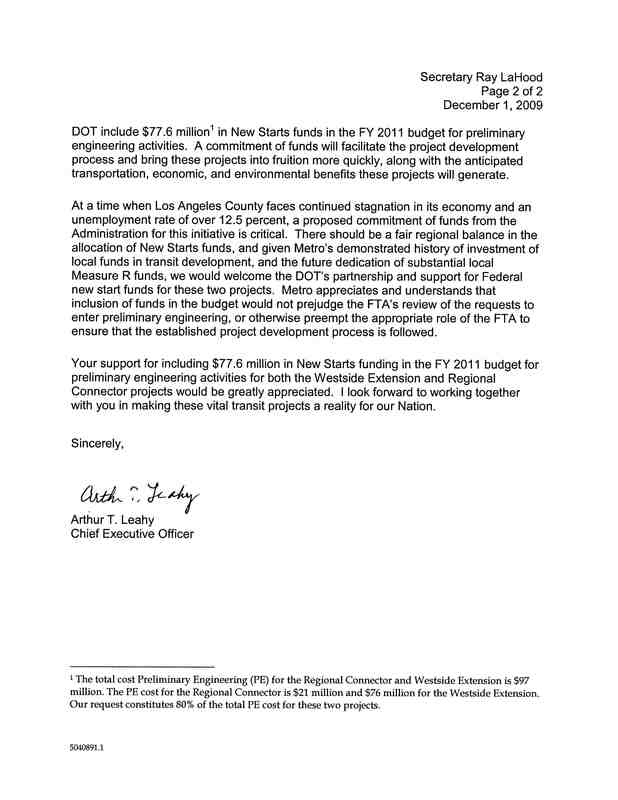 Scroll down to see the letter from Leahy to U.S. Secretary of Transportation Ray LaHood or click here. Click to see Watson’s letter and Waxman’s letter to LaHood. An identical letter also went from them to Peter Orszag, the Director of the White House Office of Management and Budget. Leahy is hoping the $77.6 million be included in President Obama’s budget for fiscal year 2011. In September, the Metro Board of Directors voted unanimously to ask the feds to help pay for the subway and connector projects. Both are receiving many millions of dollars from the Measure R sales tax approved by Los Angeles County voters last year. But both need the federal dollars to be fully built — and built in some kind of timely fashion. The request for the $77.6 million is a crucial test for the projects. For one, Metro officials want the funding to come from the New Starts program run by the Federal Transit Administration. The purpose of New Starts is to help local officials build expensive mass transit projects — most often rail lines. The Gold Line Eastside Extension received almost a half-billion dollars in New Starts. Now that the Gold Line is up and running, there are currently no Los Angeles County projects set to receive New Starts money in the 2011 budget. Meanwhile — as you may have read in last month’s post — the New York City metro area, Denver and Salt Lake City, among others — each have more than one project getting money from New Starts. So that’s one test: Do the projects meet the FTA’s requirements for funding? And does the FTA want to find a way to get L.A. County — the nation’s most populous county — into the New Starts program? The other big test is this: Will local members of Congress join Metro in pressing the federal government for the money? So far, there has been mixed reaction. In October, 14 members of Congress wrote the Metro Board asking them to expand their request beyond the subway and the connector to three other projects. The Board declined, sticking to its decision that it was more likely to get money for two projects instead of five, while also noting there are other sources of federal money outside of New Starts that other projects could seek. Two members of the Metro Board — County Supervisors Mike Antonovich and Mark Ridley-Thomas — were in Washington this week pressing for Metro to receive more federal funding. Metro’s government relations team, in the meantime, is reaching out to a number of Congressional members to get support for the funding. And Los Angeles Mayor Antonio Villaraigosa has said he is going to ask Congress and federal officials not just for the money, but to speed up the flow of it so that more than a dozen projects can be built in the next decade instead of the next 30 years. Whether Congress and the White House is listening will be seen in the coming weeks. Stay tuned.